With all this energy she expends running ramped through the house and outside, it is extremely important that she is eating healthy to keep up with her growing body. Every calorie counts at this age. Although I make a lot of sweets in my home, I don’t let my kids eat much of them. I want to make sure that what they are eating is going to benefit them. I stumbled upon this recipe from My Life in Food a little while ago, and my little girl LOVES it! These slushies are jam-packed with fruit and has no added sugar (minus a couple tablespoons of agave nectar for the entire recipe). I don’t mind her chowing down on one of these slushies in the least bit! Another great thing about this slushy is that all the ingredients are in season right now so it is the perfect time to make this recipe! Try it out, you are going to love it! An easy, delicious and healthy way to enjoy summer! 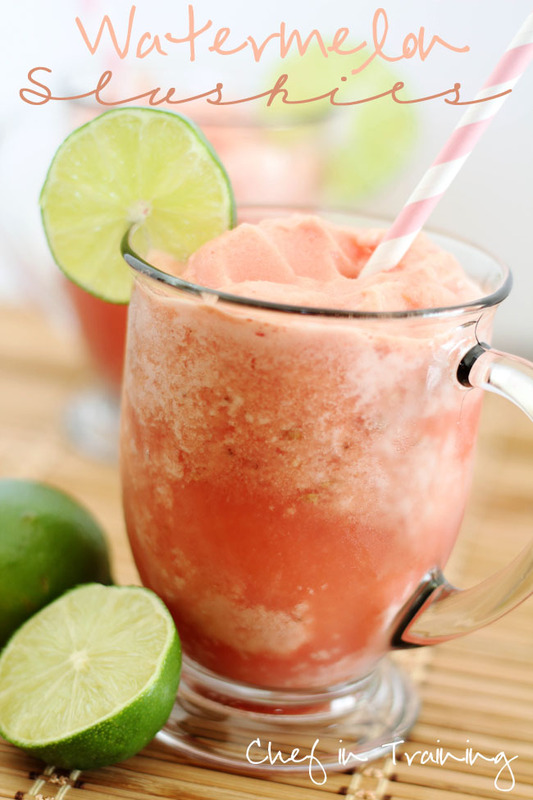 Add frozen cubed watermelon, frozen banana slices, zest and juice from 2 limes, agave nectar and water to blender. Blend until smooth. Add more water if needed to keep the mixture flowing. Yum! I love drinks like these! Your daughter sounds like a handful of fun! Thanks for all these great recipes! I love your site! I use an almost identical recipe to make watermelon popsicles -- just leave out the water. Yum! What a beautiful picture! I am thirsty just looking at the picture. Going to try this soon. These would be amazing on a hot summers day,so refreshing! This sounds SO refreshing! I'll be making it for sure, because I always have watermelon and bananas! This recipe looks great! I am going to make these slushies, and was wondering how many servings this recipe makes? This recipe looks so yummy and healthy!! Please keeps the yummy healthy recipes coming! !